The A’s Win a Weird One:: After an ugly loss the night before to start the 2nd half of the season, the A’s bounced back to win Friday night by a score of 7-3. But this wasn’t a typical win as there were a total of 14 walks (7 for each team), 7 stolen bases (4 by the A’s! ), and 17 hits (9 by the A’s) in the game. The A’s faced Joe Saunders who usually has the A’s number, but he has been struggling of late and that continued last night. 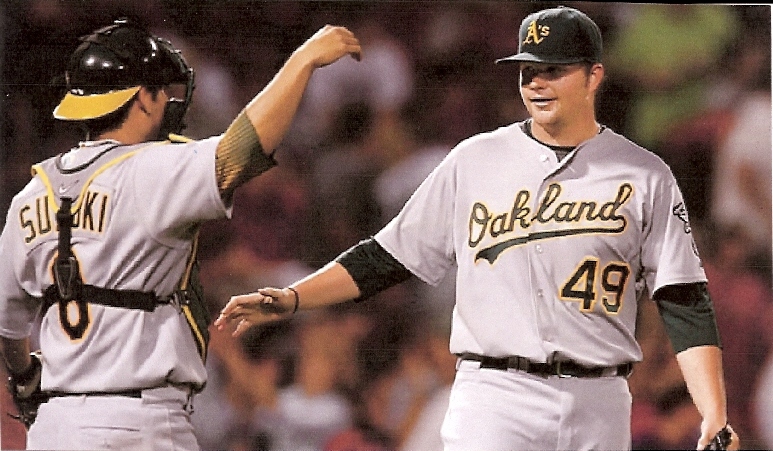 He just didn’t look confident and gave the A’s opportunities in every inning he pitched. Unfortunately until the 4th inning, the A’s couldn’t capitalize on those gifts. Bobby Crosby changed all that with a 3 run homer in the 4th. The A’s never fell behind after that. Morales’ Home Run: Three events stand out from the rest of the oddities. In the top of the 2nd inning, Kendry Morales hit a line drive to left that looked like it hit something near the fence and bounced back onto the field right to Matt Holliday. The third base umpire called it a home run. Bob Geren came out and asked for another opinion. The Umps decided to do a video review and 3 of them left the field to look at various replays of the hit. 1 umpire had to stay on the field to make sure that none of the players moved from their positions. The slo-mo replay footage that we saw in HD showed, at least to me (but not the TV broadcasters), that ithe ball hit the lens of the TV camera (over the wall) and bounced back onto the field. This was confirmed when the umpires emerged from the tunnel under the stands and the crew chief indicated a home run by twirling his upraised index finger and clearly mouthed the words: “It hit the camera.” I guess my eyesight is okay. The amazing part of the whole thing is that the camera man didn’t even flinch when the ball hit his camera! Rajai Dekes the Angel’s Catcher: In the bottom of the 4th, Raj Davis stroked a ball into the gap off Joe Saunders and motored into 2nd base. He took his usual big lead and as Saunders began his move to the plate, Raj looked like he was going to take off for 3rd, but after a few steps he stopped. The Angels catcher, Jeff Mathis glanced at Raj and obviously thought Raj would retreat to 2nd. Instead, when Mathis softly tossed the ball back to the pitcher, Raj took off and stole 3rd cleanly. He scored on Crosby’s homer 2 batters later. What a great acting job, Raj! Run, Raj, Run! In the bottom of the 6th, Raj Davis walked to lead off the inning. With Mark Ellis at the plate, Raj got caught a little too ffar off 1st base. But Saunders’ throw to 1st was way off target and went into right field rattling around among the chairs on the field near the Angel’s bullpen. Raj took off and flew around the bases and beat the throw to home, putting the A’s ahead for good. Hairston Gets Drilled a la Bobby Crosby: In the bottom of the 8th, one of Justin Speier’s sliders failed to break and hit Scott Hairston on the hand. Oh, no, I thought. Isn’t that the same guy who broke Bobby Crosby’s hand with a similar pitch last year? Yup. I hope Scott is okay. We need him in the lineup.